The AC2000 WEB Personnel XML (Extensible Markup Language) Export tool provides a simple and efficient way to export cardholder’s details, from AC2000, to a simple XML file for use in a third party system. System users can manually export AC2000 cardholder data in a standard XML format or in CEM XML format, which may be used by a secondary AC2000 access control system. Users can filter the type of data exported from a number of selectable options, ranging from: Company, Department, Card format and images. It is further possible to filter cardholders export data based on different card status for example: current card, about to expire card and Lost or Stolen card. 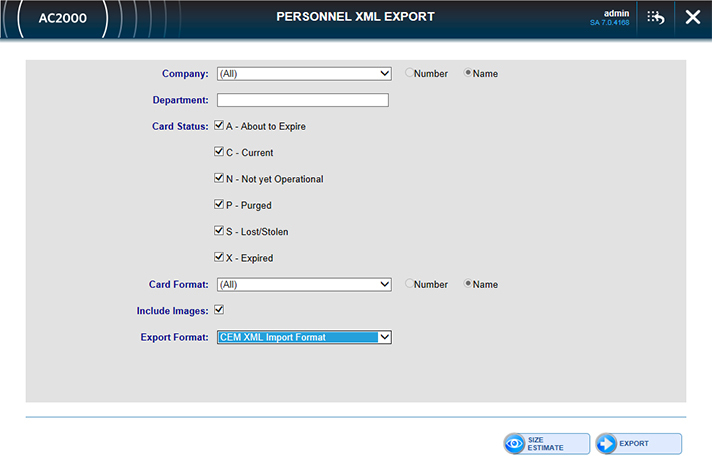 AC2000 WEB Personnel XML export tool makes it easier for AC2000 to integrate with third party systems, such as a Human Resource System or a card management system.